I’ve always enjoyed creating various things, but have done more and more with bookmaking over the past few years. An ebay seller (may have been poetsummer) had a link to her etsy store that I followed - loved the idea of the site right away. 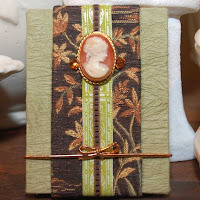 For many years I’ve made one-of-a-kind books for friends, usually to celebrate a particular special event, or sometimes to commemorate a lost pet or loved one. However, most of my creative energy went into my classical singing/teaching/performing career as well as flower gardening until 2000 when severe M.E. and congestive heart failure put a halt to anything very physical. Little by little I turned toward book projects, keeping them simple to allow for my limited veritcality, but looking for ways to keep them as creative as possible. 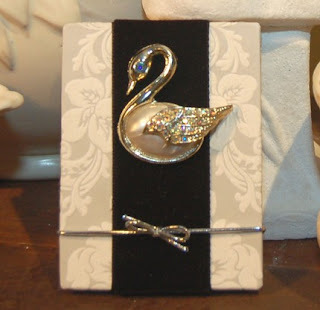 My BonnyBrooch&ButtonBooks line has been a fun creation, and a way to make more general books while still having each be unique. It’s all my baby. I love that there is so much shop-keeping that can be done in bed on my laptop. When I can be up I make books a little at a time, then photograph them. Then I can spend time writing the poems and prose descriptions for each book that I include in each listing during the many hours my heart requires me to be horizontal. I also do all of my researching/photoshopping of public domain images and poetry for my Dates to Remember books when I’m bedridden, which is wonderfully engaging. Make something that you love! I would love to have more vertical time. If my health ever allowed it would be fun to take a book-making class and experiment with making more of my own materials. I’ve always loved beautiful books, especially one-of-a-kind books, and volumes of poetry and art. One of the first books I made was a compilation of my nephew’s poetry which I illustrated with collaged images, followed by a book for a friend about birds (her favorite subject), full of illustrations and poetry that I hand-lettered, and bound with some ribbon that had been her mothers. I don’t remember a time when I wasn’t engaged in some sort of creative endeavor, from sewing to sketching, designing gardens to designing music program covers and posters. I suppose my love of poetry which blossomed more throughout my years of singing settings of poems lended itself naturally to wanting to somehow bind the words and essential feeling of a poetic experience, if that makes any sense. Romantic, quirky, provocative, whimsical, awe-inspiring - I love the idea of embracing many different moods and somehow capturing or expressing one of them in a book. 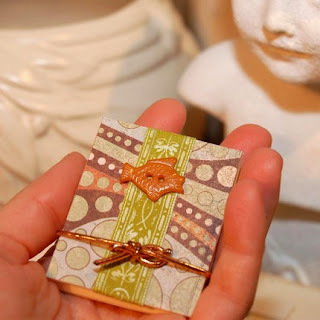 For now, I make accordion books and little hardcover books with one hand-sewn signature. My papercutter. Also my “awl” my husband made for me of a large needle secured in an exacto-knife handle. Not technically “crafters”, but, Claude Monet for his gardens, Vincent Van Gogh for his valor as much as his viscerally beautiful work, and Beatrice Wood for her joie de vivre and continual engagement with her craft. I love eating simple, whole foods . . . but every once-in-awhile I crave creamy frosting flowers from a cheap-trashy-grocery-store birthday cake! Another great interview! Always nice to get to know more BEST members through these interviews! What an inspiration! I myself have MS and am also limited to what I can do. Many days I feel like doing nothing but after reading your interview, I feel ready to go! Beautiful work! What a great introduction! Kandice, it's so nice to hear that you found a way and have continued to be creative!